Henley is not only the home of the most famous rowing regatta in the world, it is a place that has become synonymous with summer arts and entertainment with more than one music festival to its name. Yet though this town is in many ways at the forefront when it comes to contemporary entertainment, is it also a place with a great respect for its traditions and history. Henley on Thames can trace its roots back to the 12th Century when it was then a simple market town on the banks of the river. Traces of its history can be seen as you wander the streets of the town; for example the main street is filled with buildings of interest. Though many of the frontages may appear Georgian, which they are, they are actually covering much older buildings. There are an incredible three hundred individual buildings in Henley that have been marked out as having ‘special architectural or historical interest’. The riverside location of the town makes it the perfect summer destination. Here you will find the same public house where King Charles I took his ale, plus many traditional stores that have disappeared from other towns. 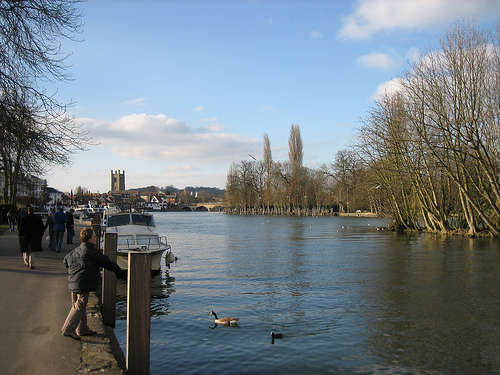 Everything about Henley is geared towards enjoying its incredible surroundings so pack yourself a picnic, grab your copy of ‘Wind in the Willows’ and head to the riverbank. There are boats to be hired if you want to try your hand on the water or you can just sit by and watch other people messing about on the water. With the town having such close links to the river it makes sense to go to the River and Rowing Museum where you will find a statue of rowing legends Sir Matthew Pinsent and Sir Steve Redgrave. You should also take a trip on the river yourself, take a row boat and gently cruise the course of the famous regatta, or try your hand out in a real row boat with the Henley Rowing Association. Tale a walk along the riverside following the Thames Path, the walk to Hambledon Lock is a gentle two and a half miles along the river, or you could opt for a guided tour of the town. Henley is also home to one of the oldest, still performing theatres in the UK and you can take in a performance here at the Kenton Theatre during your visit. Also there simply is no better place that Henley on Thames to enjoy a cream tea in the afternoon. There are a number of places close to Henley that are worth visiting if you have the time. Stonor Park is the home of Lord and Lady Camoys. It is one of the oldest manor houses in the country and houses an incredible ceramics collection. Run by the national rust Greys Court is a beautiful mansion house dating from the 16th century with wonderfully tranquil gardens. If gardens are your thing then head to The Herb Garden, here you will find a wonderful Saxon maze as well as the specialist herb nursery.